Don’t throw in the towel just yet! There are quite a few ways that you can, no matter what your financial situation, start saving. Many of you probably already have a spare change jar that you empty your pockets into each day. If you don’t, you definitely should. It’s hard to believe, but that change sure does add up fast. I’m always finding change in the washer and dryer that I guess I missed before doing the laundry. Oops! So I’m adding a jar in the laundry room. That way I’ll actually have somewhere to put all the change I find, instead of just in the pockets of the pants that I am currently wearing. Depending on the size of the container you choose, you might end up with a couple hundred dollars from what you think is worthless change each day! A pretty traditional, easy way to save is to take a portion of each paycheck and have it automatically transferred to your savings account if you use direct deposit. Of course the money can also be transferred by you if you don’t use direct deposit and receive a paper check each week. Make a few extra payments…to yourself! Are you close to paying off a loan or credit card? Make one or two extra payments of that amount into your savings account. You’ve already been making the payment for months or even years so those few extra payments shouldn’t hurt you too much! How about paying yourself for good (or penalizing yourself for bad) behavior? If one of your New Year’s resolutions is to get healthier this year, you can put $1 in your fund each time you take a walk. Or if you are trying to kick a bad habit, charge yourself $1 each time you slip and add that to your fund too. Another tactic to try is banking your savings. You can learn ways to save on any purchase here. When you go shopping and use coupons or take advantage of store sales, you’ll see those savings listed on your receipt. Add those shopping trip savings to your savings fund. What a great way to see just how much money you are saving at the store while banking some cash! 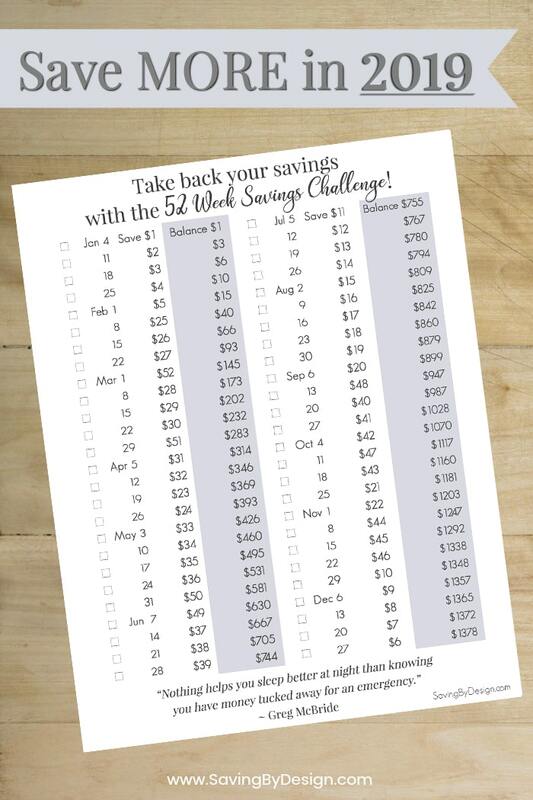 Take the 52 week savings challenge! Finally, one of my favorite ways to save ends up adding $1378 to your savings account (or shoe box) over the course of 1 year. The 52 Week Money Challenge looks to have been started by Kassondra Perry-Moreland who owns the 52 week Money Challenge facebook group. In this gradual plan you start by adding $1 the first week, $2 the second week, and so on up to $52 the final week of the year. After 52 weeks you’ll end up having saved close to $1400! Want to save more, double your weekly deposit. Don’t need quite as much, cut your deposit in half. Since saving $50 per week near Christmas (or $50 right after Christmas if you choose to do the plan in reverse) can be pretty rough, I’ve created an adjusted version of this savings plan which accounts for Christmas, other holidays, and summer vacations. I added the weekly dates for 2019, all Fridays since we should be payed by that day each week. When the time comes simply put aside the amount in the “Save” column for that week. You’ll find a running balance under the “Balance” column to see how much you have saved to date. There are also handy little check boxes in front of each week to help you keep track. While trying these savings methods in combination will rack up your savings the fastest, implementing just one will definitely help you keep more money in your pocket. « New Year’s Eve at Home with the Kids: Fun Activities to Ring in the New Year! I have used your 52-week challenge before and really enjoyed saving that way. I’m trying to print this one for this year but when I go to print, it pops up with having Xs instead of boxes for check marks. When I go to print out the plan it’s not how it looks here. Could you please change change Xs to check boxes? Do you have a plan for 2019 yet? Also, would you be able to make one with adding by $5 each week? I hope to have the 2019 plan out today or by the end of the week at the latest. As usual I didn’t get it done earlier like I would like lol. I’ll work on a $5 version too!